Emily Switzer appeared on Show 266, recorded in Jauarry 2013, at age 17. Emily Switzer, (violin), 17, is from Denver, Colorado and attends Kent Denver School. 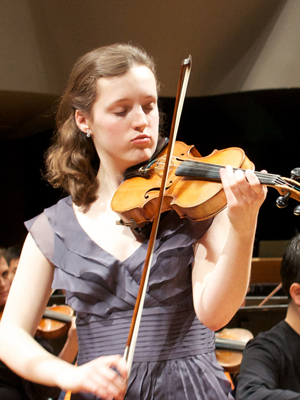 She studies with James Maurer and is the concertmaster of the Denver Young Artists’ Orchestra. In addition to playing the violin, she says that she plays “a little viola, a little less piano, and the least guitar”. In her free time, she loves to read and often volunteers at her local public library.